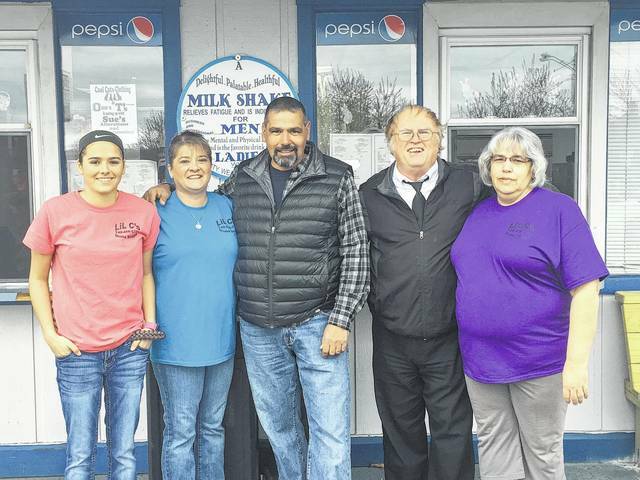 Standing in front of the Shake Shoppe in New Boston – left to right – Ciera Davis, owners Kathy and Thom Davis, New Boston Councilman Mike Payton and Julie Allen. Few businesses can be called landmarks but Thom and Kathy Davis own one. The Shake Shoppe on Gallia Street in New Boston has been there about as far back as anyone can remember. “Some elderly man that comes in daily said he has been coming here since he was a little boy in 1948 when they built it,” Kathy Davis said. Kathy and Thom purchased the company on Jan. 9 from Karen and Randy Pelphrey. “This came open and my husband said – ‘hey, I bought you something,’” Davis said. Serving up good food is nothing new the Kathy Davis. Kathy Davis said she has not changed the menu much. What may be welcomed most by the community is the fact that the Shake Shoppe will be open year ‘round, 10 a.m. to 9 p.m.
How has the reception from the community been? New Boston Village Councilman Mike Payton was on hand to welcome the Davises to New Boston. Davis said her dream is to build a new building in five years.